With brilliant view toward the hillock city, “Berkut” hotel is a charming combination of beautiful nature, quietness, modern facilities and coziness. 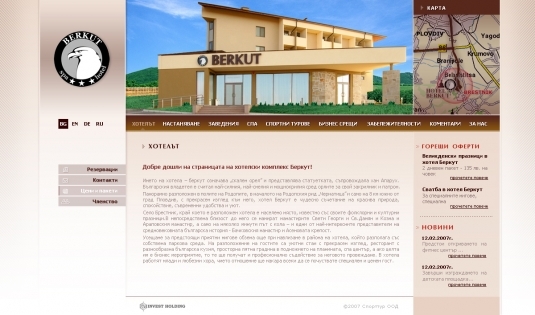 Corpus Design Studio elaborated the structure, the design and the program fulfillment of hotel Berkut’s web page. The colors and the pleasant atmosphere at the hotel are presented in the web site as well. The intuitive menus help web site navigation, so you could receive the necessary information regarding accommodation, restaurants and bars, services and entertainments. The opportunity of on-line reservation makes the web site examination even more advantageous.